I had seen mention of this book online and requested it from my local library. 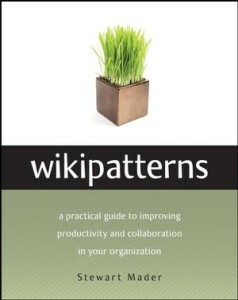 It is an interesting look at how you can drive and manage the use of a wiki in your company or group. The author has obviously been around the block in getting wikis accepted inside of companies and offers up Wikipatterns, or scenarios about the type of users and uses you will see in a typical wiki project. Additionally, I wanted to read this book to see how these patterns also might be used to understand and manage the dynamics behind forming groups, both online and face to face.